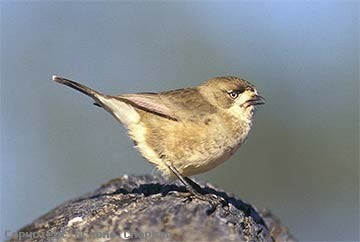 Southern Whitefaces belong to a suite of small birds that have become quite rare over large areas of SE Australia, a result of the spread of intensive agriculture, grazing and particularly irrigation. Such areas are virtually "sanitised", resulting in the removal of all dead and fallen timber and often a lot of live trees. In this respect, the firewood industry is one of the main culprits. Dead and fallen timber is the mecca of Southern Whitefaces. Even out in the middle of a wide open paddock, if one dead tree is left standing, it's likely that a pair of whitefaces will have established their territory around it, the main reason of course being that they nest in holes in trees, sometimes even fenceposts! 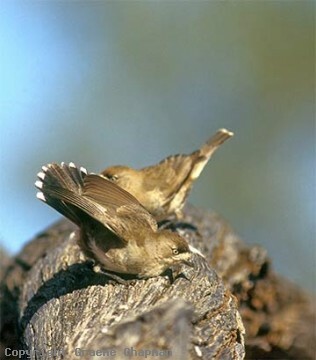 In the breeding season Southern Whitefaces live as pairs centred around their nest sites; there is also the odd record of more than two birds attending a nest. 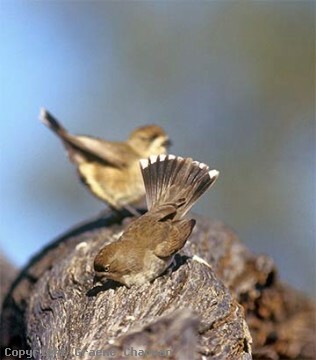 They are very shy and difficult to approach at the nest so consequently little is known about their behaviour. My pictures #s 455204 and 466205 show the behaviour of two birds near a nest hole that I interpreted to be courtship, but it could equally have been two males in a confrontation. Both birds spread their wings and tails, bowed deeply and the near bird vigorously shook its head from side to side. 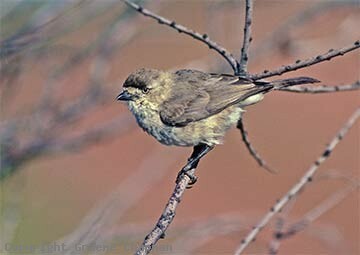 Southern Whitefaces forage mainly over open ground amongst the grasses and annuals and will actually fly several hundred metres from the nest site to a rich source of food. In winter they congregate in small flocks, often mixed with other species. 466204 ... This courtship display is accompanied by vigorous head shaking.